Just another quick post here today to share an article I stumbled upon via my favorite local co-op, PCC Natural Markets. One of their bloggers, Dr. Tom Ballard, presents a very insightful and useful article on how to determine if you're getting enough protein. As someone who's been fighting this battle for the past 2 months, I found it fascinating to learn that protein #s are one thing -- and timing of when I eat said protein is also a big factor. There's been alot of recent hype around Jamie Oliver's Food Revolution. The cheeky, charming Brit's vision is simple: overturn the existing school-lunch system in America -- extricating any and all processed foods and replacing them with real, whole food ingredients. The simultaneous goal is to re-teach our nation how to eat and cook real food, rather than processed junk that can lead to a host of health problems. Oliver selected Huntington, West Virginia -- which sat atop a CDC report as the unhealthiest city in America -- as his starting point for the revolution. A trailer for the accompanying TV series showed schoolchildren so accustomed to eating processed foods that they couldn't identify common vegetables like tomatoes and cauliflower. It nearly brought me to tears -- and incited me to action. As part of my own personal food revolution, this year I made a vow to go as local as possible: My own backyard. Nearly 7 summers ago we moved in to this quaint north Seattle home. For the first few years, I tilled and toiled the earth, planting tomatoes and basil and a smattering of wildflowers. The effort made me feel like this was truly our home. It was our dirt and our water that grew our veggies. Then everything fell to pot, and I don't mean just the patio tomatoes infected with blight. The veggie patch behind the house -- once my gardening canvas -- grew over. First with weeds, then grass; soon it was a thick mat, so overrun I didn't even know where to start. My people are earthy, growing people. My mom's side of the family owned and operated a farm in Iowa for decades (it actually earned the Century Farm stamp before they sold it a couple years back). On my dad's side, my grandmother had her own victory garden for as long as I could remember; I fondly recall playing in the dirt, pulling onions still warm from the sun to slice for a salad. As a kid, we had our own garden on a terraced portion of our home. We grew rhubarb, berries, lettuce, chard, carrots, peas, beans on poles taller than my father, and tomatoes naturally sweeter than the sugar-laced treats at the convenience store. So to not be caring for my own garden -- to have no answer when my friends and family asked what I had planted that year -- ate away at me. I felt barren, infertile. I had nothing to nurture. It stung, like a slap in the face, to buy fresh tomatoes at the co-op during the prime of summer. So this year, I'm turning over my old leaf. True, I haven't done all the prep myself. We found and hired a sweet Georgia peach, Nedra at Birdsong Dwellings, who's helped reclaim the land and set up raised beds in our backyard. And tonight, I've just come in from an afternoon of planting our beds. If I've accounted for everything, we'll be growing carrots, radishes, romaine, kale, 2 varieties of tomatoes, garlic, snap peas, basil, mint, Italian parsley, zucchini, and strawberries. I've tucked and nudged several flowers -- some edible, including viola and nasturtium -- among the crops. The knees on my well-worn yard jeans are once again stained and damp from kneeling in the moist soil. Flecks of dirt dot my shirt. My fingernails need a good scrubbing. My soul -- and, in a few months' time, our bellies -- is bursting. What's your Food Revolution? Learn more about Jamie Oliver’s Food Revolution. I'd also encourage you to sign his petition. If you need help getting started with a garden project, I’d encourage you to find a landscaper or garden artist such as Birdsong Dwellings to offer ideas, reign in your vision, and/or execute a plan. I love the creativity that comes out of Nedra’s mind! Or try a full-service operation such as Urban Farm Co. – who construct, plant, maintain, and even harvest your crops throughout the season. Just checked the start of my food-tracking. Wow - it's been 2 months already since I started eating poultry? I guess it's time to pen how I've been feeling... on the task list. The short answer is: It's getting easier, but I am still not cooking poultry at home. A friend recently asked me for tips on what to do/see in Seattle on a weekend. In return, I put together a solid list of what can be achieved in one day. If you're thinking of making a trek up here, here's what I suggest! Hop in the car and drive to Alki (west Seattle). Look back at the view of the city. Ooh and aah. 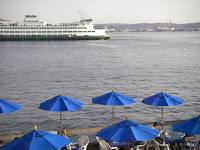 If you happen to catch Seattle on a Sunday, do brunch at Salty's on Alki*. No car? Hop on a roundtrip ferry from downtown Seattle to Bremerton. You'll see the same view of the city as you would from Alki, but also get the spray of water on your face! Head back into the city and stroll the Pike Place Market. If you're so inclined, visit the original Starbucks (be warned, the line will most likely be out the door). Listen to buskers as you wait. 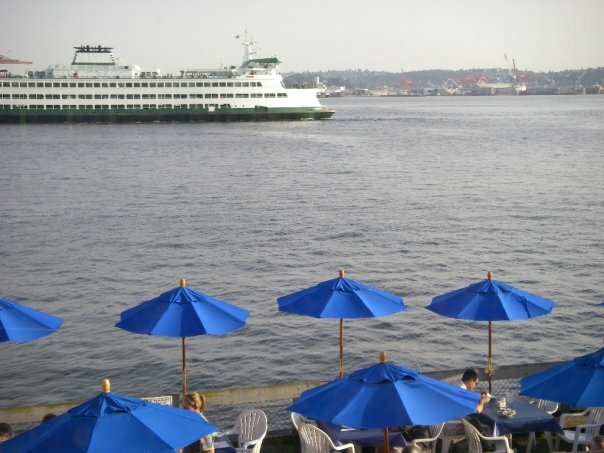 If the weather is nice and you have your sea legs about you, take a lunchtime cruise of the Seattle waterfront. Head to Seattle Center. If you're big into music, check out the Experience Music Project (it's pricey but has some cool moments). Admire the Space Needle from below (good photo opp); take a ride up if the clouds have cleared. Head up to Fremont - a little north of downtown. Take a chocolate tour at Theo. You may need reservations. Wander around Fremont - there are lots of boutiques and good bars if you need a refreshment. Next, go west to Ballard. See if there are salmon jumping at the locks. La Isla - Puerto Rican fare (better than what we ate in PR, suprisingly). If they're hopping, head across the street for a drink and nibble at Ocho, a Spanish bar. Looking for something more ritzy (and pricey)? Wander up to Volterra . You'll want to have made reservations. If you fancy something very casual (think family-style bench seating), try La Carta de Oaxaca. Expect a wait unless you're there at 5pm. Grab a drink at Balmar first. Make time before you head out of town to grab brunch. Try Portage Bay Cafe, Boat Street Cafe, or Salty's (if it's a Sunday). *You could save Alki for Sunset - especially if the weather is good. There's a good happy hour and lovely at Duke's Chowder house. Some of you know that the renovations at Chez Duchene are never really over. Since living in our home for 6+ years, we've remodeled 2/3 of it. This year, we've taken it outside. Finally, some plant life and landscaping. I had a conversation with my hairstylist a few weeks ago. While I sat in her chair, she told me her theory on plants and animals in her care: "They must pay their rent," she said. Sure, cats and dogs pay in love and affection. But the other things on the premises must actually give back. Chickens for eggs. Plants and veggies for salads. Etc. We could, I suppose, have made an attempt to buy the family farm in Iowa -- really live out the dream. But we like our city life. So, we're getting on the urban farming bandwagon. We're going to start a farm, ala what Novella Carpenter is doing in Oakland. 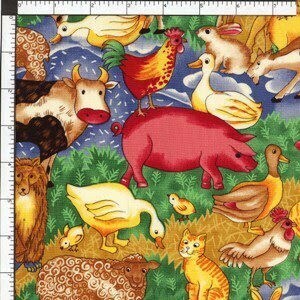 I'm talking sheep, goats, chickens. Maybe a cow or two. Things that can give back. I'm really looking forward to it!